Denis is a professor of computer science and mathematics at the Courant Institute of Mathematical Sciences at New York University. 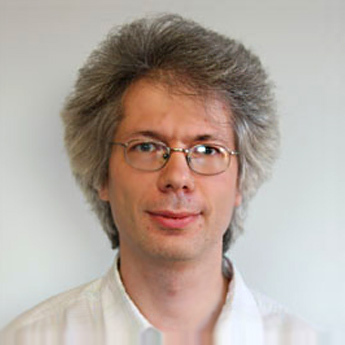 He is an associate editor of ACM Transactions on Graphics, the leading journal in the field. He was a program committee co-chair of the Symposium on Geometry Processing and program committee member of numerous conferences including all leading conferences in Computer Graphics. His former students and postdocs currently hold faculty positions at a number of universities, including Stanford, Columbia, University of Toronto, University of Texas at Austin and University of Michigan. His work has won a number of best paper awards; he currently holds five patents. He received his bachelor’s degree in in Applied Mathematics and Physics from the Moscow Institute of Physics and Technology, master’s degrees in mathematics and computer science from Ohio State University and California Institute of Technology, and his Ph.D. in computer science from California Institute of Technology. Denis’s primary interests span the domains of geometric modeling, geometry processing and scientific computing. His main contributions are in the theory and practical algorithms for subdivision surfaces, surface deformation and mapping and efficient computational methods for integral equations. I. Lashuk, A. Chandramowlishwaran, H. Langston, T.A. Nguyen, R. Sampath, A. Shringarpure, R. Vuduc, L. Ying, D. Zorin, and G. Biros. A massively parallel adaptive fast multipole method on heterogeneous architectures. Communications of the ACM, 55(5):101–109, 2012. A. Myles and D. Zorin. Global parametrization by incremental flattening. ACM Transactions on Graphics (TOG), 31(4):109, 2012. O. Weber, A. Myles, and D. Zorin. Computing extremal quasiconformal maps. Computer Graphics Forum, 31(5):1679–1689, 2012. D. Harmon, D. Panozzo, O. Sorkine, and D. Zorin. Interference aware geometric modeling. ACM Transactions on Graphics, (6), 2011. M. H. Langston, L. Greengard, and D. Zorin. A free-space adaptive FMM-based PDE solver in three dimensions. Communications in Applied Mathematics and Computational Science, 6:79–122, 2011. S. Veerapaneni, A. Rahimian, G. Biros, and D. Zorin. A fast algorithm for simulating vesicle flows in three dimensions. Journal of Computational Physics, 230(14):5610–5634, 2011. A. Rahimian, I. Lashuk, S. K. Veerapaneni, A. Chandramowlishwaran, D. Malhotra, L. Moon, R. S. Sampath, A. Shringarpure, J. Vetter, R. W. Vuduc, D. Zorin, and G. Biros. Petascale Direct Numerical Simulation of Blood Flow on 200K Cores and Heterogeneous Architectures. SC 2010: Proceedings of the 2010 ACM/IEEE conference on Supercomputing, 2010. Gordon Bell Prize. Y. Gingold and D. Zorin. Shading-based surface editing. ACM Transactions on Computer Graphics, 27(3), 2008. SIGGRAPH 2008. E. Grinspun, Y. Gingold, J. Reisman, and D. Zorin. Computing discrete shape operators on general meshes. Computer Graphics Forum, 25(3):547–556, 2006. L. Ying, G. Biros, and D. Zorin. A kernel-independent adaptive fast multipole algorithm in two and three dimensions. Journal of Computational Physics, 196(2):591–626, 2004.